Millions of these 4 TRACTS have been printed since 1969. You can read both sides of them at the Other Languages link (including English). You can also click on DETAILS about them at the English Products link. The charts in the Bible Map, Battle Map and Tribulation Map English tracts are also available as POSTERS in a 22 x 38 inch class room size. 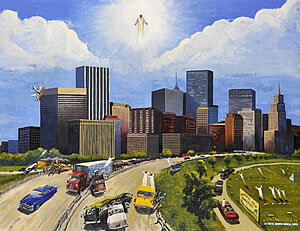 The "Rapture Picture" in the "Tribulation Map" is available as full color prints in 3 sizes. To see more information about these 4 TRACTS, the three POSTERS and the RAPTURE PICTURE, click on DETAILS for each of them at the English Products link. These same 4 printed and folded "Map" tracts are now also available in Spanish. You can request a free "Sample Pack" (in the USA) of these tracts in English or Spanish with the Free Request Form link. Worldwide, several of these tracts in various languages can now be freely downloaded, saved and printed. You can also see and read both sides of them at the Other Languages link. T he Dispensation Chart in the English Bible Map tract is also available as an 8 foot long chart. These large charts have been used since 1970 in many churches and Bible Schools and in Fair and Rodeo Evangelism booths. Click on DETAILS for the "Large 8 foot Bible Map Dispensational Chart" listed above the POSTERS at the English Products link. 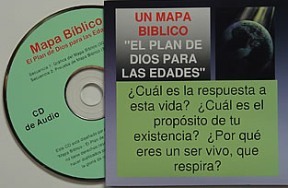 These Audio CD "Combo Packages" include a printed Bible Map tract in English or Spanish. They take listeners through the "God's Plan of the Ages" CHART and the QUIZ questions and Scriptures on the back of the Bible Map tract for evangelism and assurance of salvation. This can help people KNOW with PROOF they are on their way to heaven. Thousands have trusted Christ 100% for their salvation through God's Word in this presentation since 1969. More information is on the Bible Map Audio CD English Details and Spanish Details Links. 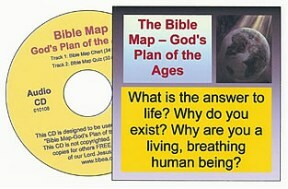 You can request a free sample of this Bible Map Audio CD in English or Spanish on the "Free Request Form" link. An Audio CD with attorney Steve Gurko telling the Amazing Journey of how God drew him to trust in the Lord Jesus Christ. Raised in a Jewish home, Steve spent years in college without exposure to the Bible and years in a successful law practice focused on life without God. But, the Lord had other plans for Steve. This CD will encourage Christians in their witnessing to professional people (and others) and it will help people with answers to questions like Steve had. 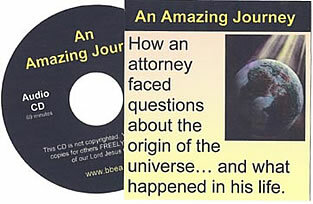 More details are on the "Amazing Journey Audio CD Combo Package" Link. 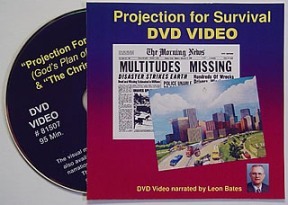 On this "Projection for Survival" DVD Video there are 500 pages of visuals, text and Scriptures showing and explaining past, present and future Biblical events in 5 sections as shown below. It’s narrated for your immediate study and teaching use. More than 20,000 of these DVD’s have been produced for teaching and evangelism. They’re now available at reduced quantity prices for even greater ministry outreach. In the USA, you can request of a free ENGLISH or SPANISH copy of this DVD Video or the following Power Point Show in ENGLISH or SPANISH on the Free Request Form link at the bottom of this page. POWER POINT SHOW, "Projection for Survival"
The Power Point Show in English or Spanish has the same 500 pages of visuals as the narrated DVD Video but the Power Point Show is without the author's narration for your own narration and teaching use. You can Download Free Worldwide this Power Point Show in English and/or Spanish. ENGLISH PRODUCTS or SPANISH PRODUCTS. POWER POINT SHOW, "The Tabernacle in the Wilderness"
In 1970, we found and for years used a beautiful set of 35mm slides on the Tabernacle in the Wilderness. Other Bible teachers who saw them agreed they were outstanding in beauty and Biblical accuracy. If you have studied and perhaps taught lessons on the Tabernacle, you know that many lessons present TYPES of Christ in the Tabernacle which He fulfilled by His perfect life and sacrificial death for us on the cross. It is a very important study for ALL Christians to understand and it can help increase their faith in God’s Word and the Lord Jesus Christ. This study has been instrumental in also helping many unsaved people trust Christ 100% for their salvation. We recently learned the copyright on these beautiful Tabernacle slides was not renewed by the originators so they are now public domain. We’ve acquired this as legal documentation and now converted them into a Power Point Show. 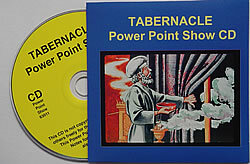 We are offering this Tabernacle Power Point Show for anyone to freely download and use worldwide. A set of associated PDF "Notes and Study Guide for Students and Teachers" can also be downloaded free. The Notes are in English but may be freely translated into other languages to use with these beautiful visuals. Over five million copies of this Rapture Picture by artist Charles Anderson have been produced in various forms and used since 1974. It shows what may happen at the instant Jesus returns as promised in 1st Thes. 4:16, 17. All truly born-again believers "in Christ" will be "caught up" (Raptured) to meet Him in the air and be with Him forever "in the twinkling of an eye." (1st Cor. 15:51, 52). With no time then to prepare it's logical this picture may portray this coming event. It has been used by many Christians to help people realize the urgency of their need to trust Christ 100% for their salvation. It's available in several sizes: 4 x 6 inch Rapture POST CARDS, 11 x 14 inch and 22 x 28 inch Rapture PRINTS to fit standard ready-made frames readily available in these sizes. At the English Products link under the PRODUCTS tab, scroll down to the Rapture Pictures, then go to "Details" on each of these Rapture Picture items for more information and quantity prices. For more information and quantity prices. We offer several FREE items inside and outside the USA. Outside the USA you may freely download the Power Point Show (above) and also several other free items at the Other Languages link under the RESOURCES tab. Inside the USA you can also use the Free Request Form to request several items mailed to your USA address.